Once team Momentum announced its “online survey” of all members and supporters, the result was a forgone conclusion. In plebiscites the dictator get to ask the question and barring accidents they get the result they want. Not only were the questions loaded, they were also disgracefully backed up by Jeremy Corbyn, Clive Lewis and Diane Abbott. Topping it all it was team Momentum which did the count … a wonderful opportunity to gerrymander. So, with a victorious 80.6% voting for OMOV, at a stroke, the national committee, steering committee and regional committees were abolished. Now, there will only be a powerless ‘official’ Momentum conference and members have to agree to accept the constitution and join the Labour Party (even though many have been already barred or expelled because of their activity in support of Momentum). Jon Lansman’s coup de’gras was a long time in coming … and, frankly, we are surprised it took him so long. Even though he has handed ownership of ‘Momentum Data (Services) Ltd’ to his ally Christine Shawcroft, he is still is in charge of ‘Jeremy for Labour Ltd’. In other words legal control of Momentum lies not with its membership nor its elected committees. No, it lies with its tiny group of shareholders (very capitalistic). 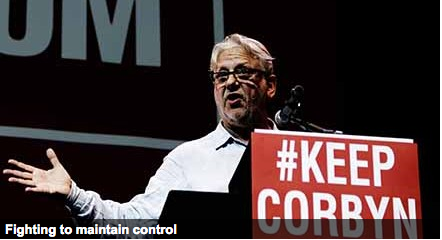 First, Lansman cancelled the Momentum national committee meeting that was due to take place on November 5. Then the small leftwing minority on the steering committee under the leadership of Matt Wrack (leader of the Fire Brigades Union) fought back and encouraged NC members to go ahead and meet on the same day. This and an intervention by John McDonnell MP to “sort this mess out” led to an “unanimous statement” of the SC, which forced Lansman to allow another meeting of the NC to take place on December 3. But, despite his best efforts to stuff this meeting with people who are on board with his vision of transforming Momentum into nothing more than a well-financed phone bank, a majority voted – just – to hold a democratic conference, which would see real-life delegates discuss real motions and, crucially, agree on a constitution. A conference arrangements committee (CAC) with a small pro-democracy majority was set up which invited branches to submit motions and select delegates. Lansman did not take this defeat lying down, however. A media onslaught followed, in which Paul Mason, Owen Jones and the “naive” Laura Murray declared that ‘old Trots’ were holding Momentum hostage. Lansman then sent out the “online survey” to all members and supporters, which was stuffed full of (mis)leading questions. It is actually amazing that under those conditions 12.5% of participants ticked the box opting for decision-making by delegates. (As an aside, we know the survey was also sent to the well over 150,000 contacts marked as Momentum supporters, but their responses are not listed – presumably because the turnout was much worse than the 40.4% of members who replied.) The CAC ploughed on and announced on December 21 that a two-day conference would take place on February 18-19 and encouraged branches to elect delegates and vote on motions. Let us now look at the climactic action that has propelled us into the third – and no doubt final – act of Momentum’s existence as a potentially useful site for the exchange of ideas. At 6pm on January 10, the CAC announced that, although it was “unable to get in touch with the steering committee” and was having its ability to communicate to members delayed, disrupted and censored by Jon Lansman’s team Momentum, a conference venue had been booked. For financial and organisational reasons, this was now scheduled as a one-day event on Sunday February 19 in Rugby. The CAC encouraged all members to “book transport now”. At 7.39pm on the same day, Jon Lansman sent an email to the Momentum steering committee,1)You can read the full text here http://socialistnetwork.org.uk/2017/01/10/an-email-from-jon-lansman-to-the-momentum-steering-committee/ in which he asked the committee to impose on the organisation its first constitution, which would abolish the SC and all other Momentum structures and committees. At 8.54pm he declared in another email to SC members that he had now received “a majority” in favour of his proposal (ie, his six allies out of the 11 SC members had replied) and that therefore the committee no longer existed. All national and regional structures in Momentum were abolished at that moment. The conference arrangements committee was declared non-existent. All online discussion forums for regional committees on www.loomio. org were deleted and branches’ access to the Momentum database severely restricted. 80.6% of respondents said that key decisions should be taken by ‘one member, one vote’, rather than by delegates at regional and national conferences and committees (12.5%). 79.3% of respondents said all members should have a say in electing their representatives, as opposed to national representatives being elected by delegates from local groups (16.2%). Following this decisive response, the steering committee voted to introduce a constitution for Momentum to deliver the kind of action-focused, campaigning organisation that our members want. So, let’s get this straight: 80.6% said they wanted to have a say on all key decisions – so the best way to implement this is to ignore them all and just impose a deeply undemocratic constitution on them (see William Sarsfield’s article). This is pure cynicism. With an amazing power of foresight, weeks before the survey was sent out, Paul Mason had already announced on the Daily politics show on December 8 a key plank of this so-called constitution: the purge from Momentum of all those troublesome lefties who have been expelled from the Labour Party. He claimed, wrongly, that in order for Momentum to qualify as an affiliated organisation of the Labour Party its members had to be current individual members of the party. This is clearly not the case: members of affiliated organisations – eg, trade unions – are entitled to become “affiliated members” of Labour, who enjoy fewer rights than full members. No, this has nothing to do with trying to implement the results of Lansman’s deeply flawed survey or even plans to transform Momentum into a Labour affiliate. This is a witchhunt against the troublesome left within the organisation. Again and again, it has obstructed his plans to strangle the political life out of Momentum in order to preserve it as a mere fan club for Jeremy Corbyn: a money-heavy, democracy-light organisation that could be used as a massive phone bank for this or that Lansman-approved campaign or a mobilising tool when the next coup against Corbyn happens. The more naive observers of the current crisis have pleaded for Jeremy Corbyn to step in and bring Lansman to heel. Nick Wrack demands to know on Facebook “who in the leader’s office” Lansman has consulted. But, while Corbyn might not have been involved in plotting the finer details of this coup, there can be no doubt that he will be on board with the basic trajectory. His recent email to Momentum members pushing Lansman’s survey has demonstrated this reality. Neither Lansman nor Corbyn have any interest in Momentum becoming a vibrant, decision-making, memberled organisation that could fight for democracy and socialism. 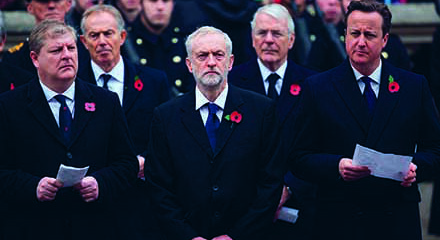 Any such organisation would undoubtedly embarrass the Labour leader sooner or later. A truly democratic conference would see motions criticising this or that particular attempt of Corbyn’s to become a “populist”, which has, for example, seen him zig-zagging over the question of immigration, Trident and Brexit. Corbyn will not be happy about the negative press reports, of course – but he is on board when it comes to stamping out Momentum as a vibrant organisation. The uneasy peace settlement in Momentum has now come to an abrupt end. The knives are out. 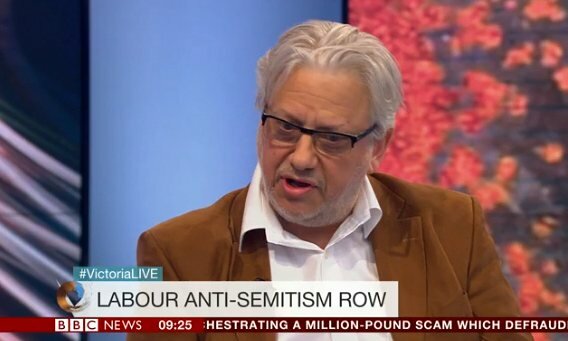 Lansman has declared that, yes, there will be a conference, but it will be organised by his own personal company, ‘Momentum Campaign (Services) Ltd’, will take place on February 18 and will hear “no motions”. Instead, his “conference” will concentrate on “workshops” and “exciting speakers” and will no doubt look a lot like ‘The World Transformed’ event at the 2016 Labour Party annual conference. A happy ending to this drama seems unlikely and a split the most likely outcome. Credit to the CAC, which – as we go to press – continues to plan for its own conference on February 19, with motions being discussed and decisions taken democratically (though the details are still understandably fuzzy). Labour Party Marxists supports this fightback. We would urge Momentum members and supporters to attend both events and fight for democracy, socialism and transparency on the two consecutive days. Jon Lansman might have won this particular battle, but he is not going to ride into the sunset with a smiling Corbyn on his back. Without a strategy of fighting to transform the Labour Party into a real party of labour – a strategy that would require challenging Corbyn when he goes wrong, rather than giving him carte blanche – Momentum is nothing but an empty shell that is likely to run out of members and money before long. Whether ‘The end’ for Momentum can become the beginning for something better remains to be seen. 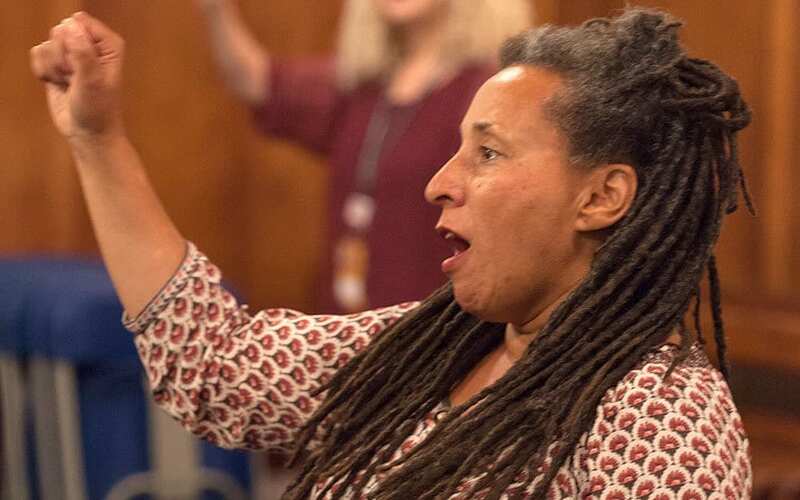 September 30, 2016 Comments Off on Defend Jackie Walker!